These high quality heated towel rail radiators are the perfect combination of Style and sophistication in traditional style Towel Rails Radiators with high quality seamless glowing chrome finish rails, providing a higher heat output to warm your towels and keeps your bathroom cozy & comfortable. Below mentioned are the features of this useful product that will make you buy it right away. Finish glow to the Towel Radiator. Testing: Tested for complete safety standards. Heat up well, keep bathroom warm and looks very good. It not only work very well but very easy to install. Its quality is amazing. It heats towel fast and keeps them warm for you. I am impressed by its quality. 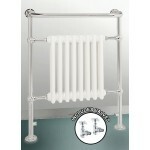 This is the best radiator I have used so far. My luck with radiators was never good. But this radiator stunned me, I installed this few months back and its quality is outstanding. Doesn't take unreasonable space, heat fast and looks stunning.